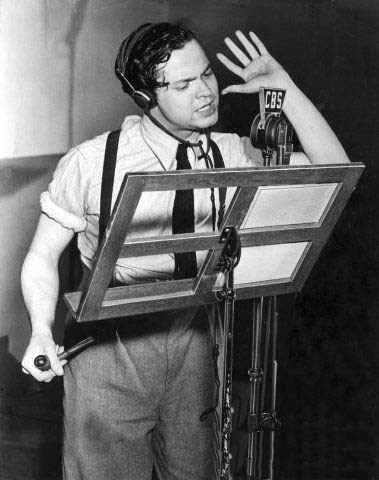 Here you can download the version of The War of the Worlds that Orson Welles famously adapted and aired on national radio in October 1938. Presented so that it sounded like an actual news broadcast, the Orson Welles version was mistaken for truth by many listeners who caught the program midstream (more info here), and, soon enough, they found themselves fleeing an unfolding Martian invasion, running down into their basements with guns cocked and ready to fire. You can catch the mp3 version of the famous Welles recording here (and also alternatively here). Have fun with this broadcast. It's a classic. Related content: For more old time, sci-fi radio broadcasts, check out this nice collection on iTunes. In 2003, the Harvard biologist E.O. Wilson wrote a widely read essay that called for an "Encyclopedia of Life." Summed up simply, Wilson had in mind "an online reference source and database" that catalogued "every one of the 1.8 million species that are named and known on this planet," not to mention the many organisms that aren't yet known. When fully compiled, the web-based database would offer a "macroscope" of sorts, a way to do comparative biology and ecology on an unprecedented scale, allowing scientists to gain new insights into the immense biodiversity of our planet. For more information on E.O. Wilson, I would encourage you to listen to Bill Moyers' profile of Wilson (iTunes - Feed - MP3) which recently aired on PBS. You may also want to give some attention to Wilson's latest book, The Creation: An Appeal to Save Life on Earth. Every year the folks at the Bulwer-Lytton Fiction Contest celebrate their love for bad prose by running "a whimsical literary competition that challenges entrants to compose the opening sentence to the worst of all possible novels." They've just announced this year's champion sentences and they're well worth a read. The contest accepts entries year-round, so if you think you've got what it takes to write the worst sentence of 2008, feel free to take your shot. More minor, but nonetheless interesting, forays into the digital world include some recent experiments on the podcast front. Not long ago, we mentioned that The New Yorker's trademark cartoons have been animated and can be watched as video podcasts (iTunes - Feed). Then there's The New Yorker Fiction (iTunes - Feed), another relatively new podcast that features famous fiction writers reading out loud selected short stories from the magazine’s fiction archives. (It's issued only monthly.) Finally, to round things out, another podcast has recently emerged, and it's simply called Comment (iTunes - Feed) and that's because it lets you listen to a weekly reading of the magazine's "Comment" essay, often written by Hendrik Hertzberg, Nicholas Lemann, or David Remnick himself. For a complete list of New Yorker RSS feeds, click here. You can find the podcasts mentioned above, and others like them, in our Arts & Culture Podcast Collection. Ingmar Bergman, one of the great filmmakers of the last century, has died at 89. You can read the full obit in the NY Times here, and catch a piece of his masterwork Persona below (or buy the film in full here). Film buffs may also want to check out Bergman's autobiography, The Magic Lantern. What's gone wrong with America's democracy? It's a question that Al Gore takes a hard look at in his recent (and well-reviewed) book, The Assault on Reason. Below, Gore gives you the gist of his argument in a half-hour video. It's a bit heady. He's invoking the Ancient Greeks, the Enlightenment, Edward Gibbon, Adam Smith and John Stuart Mill. What's more, his thinking is heavily informed by Jurgen Habermas and his writings on rational political discourse. And it all loops into an explanation of how we've taken a wrong turn on the Iraq war, the environment, civil liberties and beyond. Yes, it's heady stuff. But if Open Culture readers can't handle it, who can? The link to the original video is here. Click here for more free audiobooks.